Edward T. Hinson, Jr. « James McElroy & Diehl, P.A. Ed Hinson began his practice as an Assistant District Attorney in Charlotte. In just over four years as a prosecutor, he was lead counsel for the state in a number of jury trials, including several capital murder prosecutions, embezzlements, rapes, armed robberies and other serious crimes. In 1981, Ed joined James, McElroy & Diehl, where his trial practice comprises both civil and criminal matters in state and federal courts. His practice also includes frequent representation of lawyers and law firms, physicians and other medical professionals, as well as business leaders and their companies before regulatory bodies, arbitration panels and the FINRA. Ed appreciates the importance of his clients’ privacy and, due to his discretion in handling sensitive matters, often his cases have escaped public attention. 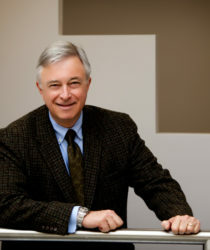 Ed is a member of numerous bar organizations, and was elected to the American College of Trial Lawyers in 2003. He is active in his community and currently serves on the North Carolina Judicial Standards Commission, the board of directors of the McLeod Center, the Advisory Board of the UNCC Center for Professional and Applied Ethics, and is a life deacon in his church, having served as chair of the board of deacons.